My ingame name is PixelGeek, also knows as plain Pixel. The reported scam was noticed by the Mod Gay_Farmer and myself on the 18th of March, 2019. The town E-stoc, founded by Aldosius and Dye, was built to be a a large, public farm (public for it's residents). It featured all sorts of automated crops farms, spawners and afk farms. 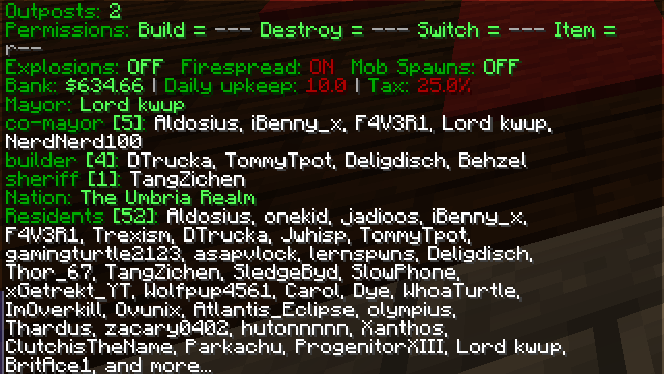 After the two founders completed the project, they gave the towns mayorship to kwup and left the server to do the same thing over again on another server. Many of E-stoc's citizens bare a nicely filled wallet, e.g. TommyTpot, with approx 300k as of 3 days ago. When I first saw the farms of e-stoc, I was impressed. They were nicely build, pretty and optimal for the public use. Apparently though, kwup wanted to ruin all of this. I noticed early on that kwup was stripping down parts of the farms and selling them. I myself even bought the slime spawner and attempted to buy the silverfish spawner he got from the town's farms. The last move of his apparent masterplan was to transform the town into a complete scam, or money making machine. He suddenly pumped up the towns taxes to the max percentage (25%) and laid back to earn his money. Today, his town got 98 thousand dollars in tax money, which he was quick to claim and spend. With the money he got from the town he quickly bought into Warrior, Harbringer, and today Captain. Not only did he steal this money from his citizens but he also spend it rapidly and then even felt superior, calling me the "inferior Warrior". TommyTpot lost about 60k just by this one towny tick today. I know that a big counter argument might be, that he technically didn't do anything wrong. That his citizens joined the town out of their free will. But you really have to think about the fact that e-stoc didn't have any of these outrageous taxes before he got the position of mayor. Suddenly pumping the taxes up without any of his major citizens knowing, is just utter theft. I also do believe that if the percentage limit wasn't at 25%, he would've lifted them even higher. Sadly, I do not have screenshots of the aforementioned 98k gain in taxes, although I am sure that this could be proven easily with logs and whatnot. I have since been informed that it was in fact Sr.Mod Papaboyer who first noticed this issue and then informed Mod Gay_Farmer.